Trials in DME assessed treatment regimens, combination treatments, and a novel route of administration. • The TREX-DME trial compared outcomes of a monthly anti-VEGF treatment regimen to those achieved with two treat-and-extend (TAE) regimens. • The HULK trial investigated the role of suprachoroidal steroid administration. • Protocol U of the Diabetic Retinopathy Clinical Research Network (DRCR.net) analyzed the role of intravitreal steroids in patients with treatment-resistant DME. This article reviews some of the notable findings from these trials and their implications for retina practice. • In TREX-DME, a statistically significantly decreased treatment burden was seen with use of two treat-and-extend regimens as compared with monthly injections. • In the HULK phase 1/2 trial of suprachoroidal steroid administration, visual gains were more prominent in treatment-naïve patients than in previously treated patients. • In DRCR.net Protocol U, addition of intravitreous dexamethasone to continued ranibizumab therapy in patients with persistent DME did not improve visual acuity at 24 weeks compared with ranibizumab monotherapy. Previous pivotal studies in DME such as RISE and RIDE have shown that a monthly injection regimen works well to improve vision and decrease macular edema.1 However, in real-world practice, retina specialists do not always perform monthly injections. Thus, it is important to establish how other commonly used treatment algorithms, such as TAE, compare to monthly injections. Additionally, innovations in focal laser administration might also affect the visual and anatomic outcomes in this patient population. TREX-DME is a multicenter, prospective, randomized clinical trial comparing the efficacy of a TAE dosing algorithm, with and without angiography-guided focal laser treatment, with monthly dosing for center-involving DME. Patients were randomly assigned to one of three groups: 30 eyes were treated with monthly ranibizumab 0.3 mg (Genentech), 60 eyes were treated with ranibizumab according to a TAE protocol without macular laser photocoagulation (TREX), and 60 eyes were treated according to a TAE protocol with angiography-guided macular laser photocoagulation (GILA). Patients in all three groups received initial monthly injections for 4 months. For the next 2 years, the monthly group was continued on monthly injections. In the TREX group, the treatment interval at each visit was extended by 2 weeks, maintained, or decreased by 2 weeks based on the patient’s central retinal thickness. Eyes in the GILA cohort were treated similarly to those in the TREX group but also received angiography-guided macular laser photocoagulation with the 532 nm Navilas laser system (OD-OS) at week 4 and again every 3 months if microaneurysm leakage was present on fluorescein angiography. 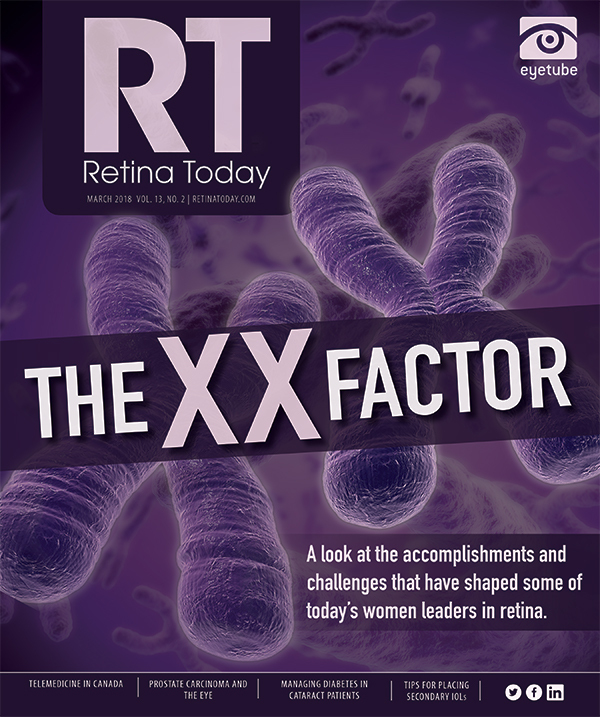 The 2-year TREX-DME results, presented at the 2017 American Academy of Ophthalmology (AAO) Retina Subspecialty Day by David M. Brown, MD, indicated that the results seen at 1 year persisted.3 Improvements in best corrected visual acuity (BCVA) ETDRS letter score were not statistically significantly different among the three groups: monthly, +8.3; TREX, +11.4; and GILA, +10.5. Anatomic results on spectral-domain optical coherence tomography were also similar among groups. There was a statistically significantly decreased treatment burden, including lower numbers of treatment visits and longer treatment intervals, in both TAE groups compared with the monthly group. Once again, adding angiography-guided laser photocoagulation did not significantly change the outcomes. The 3-year results of TREX-DME are expected to be presented in the upcoming year. The suprachoroidal space is being explored as a novel route for delivery of pharmaceuticals in multiple retinal and choroidal diseases. The HULK trial, an open-label, multicenter phase 1/2 clinical trial, was designed to assess the safety and efficacy of preservative-free triamcinolone acetonide delivered suprachoroidally (CLS-TA; Clearside Biomedical) in patients with DME. Suprachoroidal delivery of this corticosteroid agent is performed with a specially designed needle. The 6-month endpoint results of HULK were presented by Charles C. Wykoff, MD, PhD, at the 2017 AAO Retina Subspecialty Day.4 The study included 10 treatment-naïve patients and 10 patients previously treated with anti-VEGF agents or intraocular steroids. Patients in the previously treated arm had received, on average, 23 previous treatments. CLS-TA was administered at the baseline visit and then as needed based on central retinal thickness at months 2 through 5. The treatment-naïve group also received aflibercept (Eylea; Regeneron) at the initial baseline visit. At 6 months, the average number of injections was three across the entire study population. Visual gains were more prominent in the treatment-naïve population (8.5 mean letter gain in the treatment-naïve group vs. 1.1 mean letter gain in the previously treated group). In anatomic results, 89% of all patients had 50% or more reduction in central retinal thickness by 6 months. No serious ocular or systemic adverse events were seen. Intraocular pressure (IOP)–lowering medications were started in 15% of patients, and 10% of patients had IOP elevation > 10 mm Hg. A larger trial examining the role of CLS-TA in DME is under way. The TYBEE trial is a multicenter, randomized, masked, controlled phase 2 trial in which treatment-naïve patients are randomly assigned either to a combination arm to receive suprachoroidal CLS-TA together with intravitreal aflibercept or to a control arm receiving aflibercept monotherapy. Protocol U was a study by the DRCR.net investigators that focused on patients with persistent central-involving DME and visual acuity impairment despite previous treatments. The aim of the study was to compare the combination of steroid and anti-VEGF therapy to anti-VEGF monotherapy regarding visual acuity and anatomic outcomes. To establish that enrollees were treatment-resistant with incomplete response to anti-VEGF therapy, participants had to meet prespecified criteria and had to have received at least three intravitreal anti-VEGF injections within the previous 20 weeks. Additionally, during the run-in phase, study patients received three additional ranibizumab injections approximately 4 weeks apart to ensure that all enrolled eyes truly had persistent DME. Subsequently, the eyes that met the criteria for persistent DME after the run-in phase were randomly assigned to dexamethasone intravitreal implant 0.7 mg (Ozurdex; Allergan) (65 eyes) or sham treatment (64 eyes) combined with monthly intravitreal ranibizumab. The dexamethasone implant was administered at baseline and could be readministered beginning at 12 weeks in eyes with persistent edema. The study endpoint was 6 months. Raj K. Maturi, MD, presented the findings of Protocol U at the AAO 2017 Retina Subspecialty Day,5 and the results were also recently published.6 No statistically significant difference in visual acuity between the two groups was seen at the study endpoint of 24 weeks. Change in BCVA was +2.7 letters in the combination group and +3.0 letters in the ranibizumab monotherapy group (P = .73). The proportion of eyes achieving a BCVA gain of ≥15 letters was significantly greater in the combination group than in eyes receiving monotherapy with ranibizumab (11% vs 2%, P = .03). However, combination treatment was also associated with a trend toward a higher rate of BCVA loss of ≥10 letters, although the difference was not statistically significant (13% versus 6%, P = .09). With regard to anatomic results, on OCT, approximately half (52%) of patients receiving combination treatment had a flat retina while only a third (31%) of those in the anti-VEGF monotherapy arm did. Both phakic and pseudophakic patients were included, but the study was not powered to determine the difference between results in the two groups. In the combination group, 29% of patients experienced increased IOP or required treatment with IOP-lowering drops. No patients in the ranibizumab monotherapy group did. These studies highlight important concepts in the treatment of DME. They address issues that are pertinent to every retinal specialist. Evidence-based treatment protocols will lead to better visual and anatomic outcomes and might minimize the treatment burden. Treatment of persistent DME is always a challenge and we now better understand the role of combined treatments. Moreover, novel therapeutic approaches might change the way we take care of our patients in the future. 1. Nguyen QD, Brown DM, Marcus DM, et al. Ranibizumab for diabetic macular edema: results from 2 phase III randomized trials: RISE and RIDE. Ophthalmology. 2012;119(4):789-901. 2. Payne JF, Wykoff CC, Clark WL, Bruce BB, Boyer DS, Brown DM; TREX-DME Study Group. Randomized trial of treat and extend ranibizumab with and without navigated laser for diabetic macular edema: TREX-DME 1 year outcomes. Ophthalmology. 2017;124(1):74-81. 3. Brown DM. TREX-DME Trial: two year outcomes. Paper presented at: American Academy of Ophthalmology Annual Meeting Retina Subspecialty Day; November 10-11, 2017; New Orleans. 4. Wykoff CC. Suprachoroidal triamcinolone acetonide with and without intravitreal aflibercept for diabetic macular edema: results of the 6-month prospective, phase 1/2 HULK study. Paper presented at: American Academy of Ophthalmology Annual Meeting Retina Subspecialty Day; November 10-11, 2017; New Orleans. 5. Maturi RK. Protocol U: short-term evaluation of combination dexamethasone + ranibizumab vs. ranibizumab alone for persistent central-involved DME following anti-VEGF therapy. Paper presented at: American Academy of Ophthalmology Annual Meeting Retina Subspecialty Day; November 10-11, 2017; New Orleans. 6. Maturi RK, Glassman AR, Liu D, et al; Diabetic Retinopathy Clinical Research Network. Effect of adding dexamethasone to continued ranibizumab treatment in patients with persistent diabetic macular edema: A DRCR Network phase 2 randomized clinical trial. JAMA Ophthalmol. 2018;136(1):29-38.